Crowne Plaza Redondo Beach sits along the coast of Southern California, near the Redondo Beach Pier and Marina. The hotel pool is a popular spot for Weddings and other events with its stunning coastal view. The pipes feeding the Hotel’s Terrace Pool and Spa were leaking, causing massive amounts of water loss. The pipes are encased in structural slabs over the roof of the hotel’s parking structure, so traditional repairs would prove costly, invasive, and extremely inconvenient for the busy hotel. The hotel contacted local Southern California ePIPE installer, Pipe Restoration, Inc. (PRI). 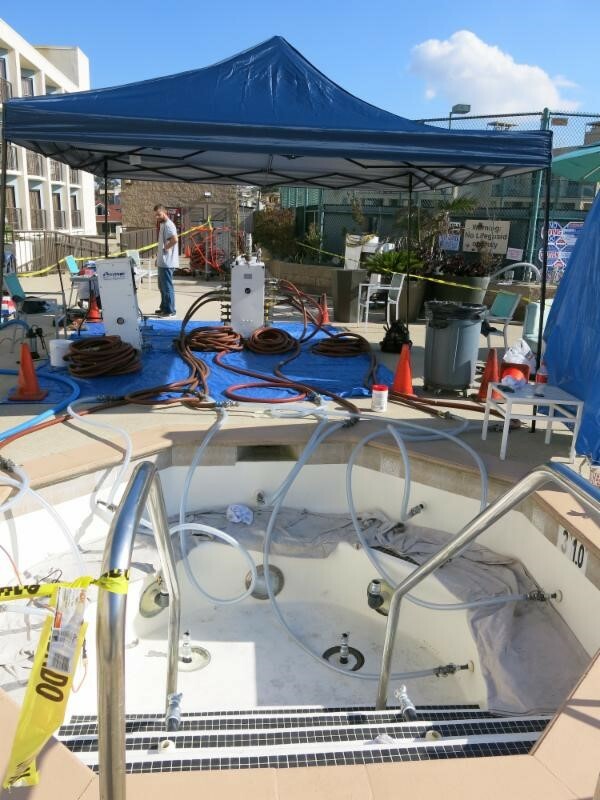 PRI technicians inspected the pool and spa piping, and discovered multiple leaks throughout the system. o restore the piping system in just a few days time. The hotel was able to quickly resume the normal pool and spa schedule and hold special events with peace of mind knowing that the leaks were a thing of the past.